We offer many different types of body and facial treatments to keep your skin looking its best. 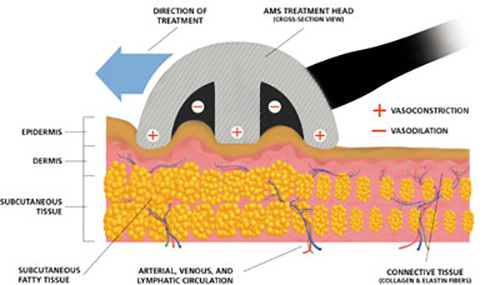 Synergie cellulite treatments provide specific vacuum assisted Massage Therapy for optimal stimulation, stretching and pressure to subcutaneous tissues offering a type of subdermal tissue massage not possible through traditional massage techniques. A typical Synergie treatment program consists of a series of twice-weekly sessions, followed by monthly maintenance visits. The number of sessions is customized to meet the individuals goals. Full body treatments take 30 minutes at least twice per week for a minimum of 8 weeks. Synergie treatments are not limited to your thighs, hips and buttocks. Synergie also provides benefits for the neck and face. The Synergie facial massage program helps to improve circulation locally there by smoothing and tightening the skin. 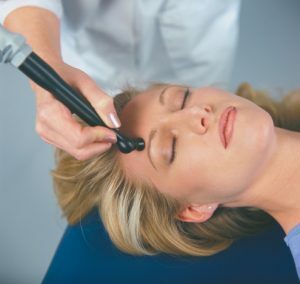 Synergie Facial Sculpting treatments usually takes about 40 minutes. A 3-week regimen of 2-3 treatments a week is recommended. Gentle, yet deep, exfoliation using fine jets of mineral micro-crystals. The formation of new collagen and elastin are stimulated while skin color and texture are dramatically improved. A series of sessions will achieve the best results and includes either infrared or blue light therapy. Expert Massage Therapy combines with all aspects of a classic facial, Synergie face sculpting and Microdermabrasion are combined in one session for unmatched results. The Synergie™ Peel® Plus is designed to treat more than the surface of the skin. 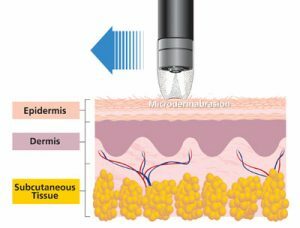 While microdermabrasion is peeling away the top skin layer, vacuum-assisted massage is treating the dermis and subcutaneous tissue to enhance the circulation. Synergie™ Peel® Plus - treating from the inside out, because beauty is more than skin deep. Hot Stone massage therapy releases pain and tension from the jaw, neck and shoulders while it soothes the whole nervous system. Aspects of a classic facial are included. Sculpting of the face, neck and shoulders combined with nerve rejuvenation that awakens your beauty and renews your inner-self. Expert massage therapy is combined with a series of patterned strokes and energetic touch sequences over 12 major facial nerve centers used to redefine facial features. These facial treatments include cleansing, exfoliation, toning and either a deep cleansing or moisturizing mask. A treatment that visibly enhances the skin's texture and maximizes hydration. This refreshing soft lift off mask combines the hydrating benefits of seaweed- the oceans finest natural resource with revitalizing propolis, a natural healing and desensitizing substance rich in natural antibiotics and vitamin A. Massage augments all aspects of this facial. Soothing, nourishing and calming, it renders the skin undeniably radiant with highly visible results. Good for all skin types and excellent for sensitive, eczema and psoriasis prone skin types. Restorative Massage Therapy is combined with customized deep cleansing, exfoliation, toning and mask that reinvigorates your skin! This facial is personally tailored to treat your skin's needs. From a range of masks targeting concerns of aging, sensitivity, dehydration or congestion. Delivers a bright healthy glow. A specially designed facial treatment rich in green tea, french rose and licorice extract, gently cleans and hydrates the face to help heal while reducing blotchiness and irritability caused by microcirculation problems. Infrared light completes the facial to further reduce redness and irritability. Facial massage enhances this experience. A potent blend of stabilized vitamin C combined with the latest high-tech formulation of freeze-dried seaweed- the ocean's finest resource! It reduces fine lines, strengthens elasticity and provides relief for dull, sun-damaged skin. Your complexion emerges renewed, firm and extremely smooth with a luminous glow. Expert massage therapy brings all these benefits together. For all skin types except acne. Facial treatments utilizing an advanced enzyme to digest impurities. Expect amazing results as unique ingredients smooth scars, heals blemishes, controls oil and quickly stops bacteria from spreading using a time release delivery system that works all day. Massage therapy addresses the stress component of acne. Blue light completes the facial to further kill any deep bacteria and help stop future breakouts. Also known as photo-rejuvenation, Light Therapy has been shown through years of research to increase ATP synthesis thus, accelerating cellular metabolism and collagen production. Synergie Light Therapy facial treatments are the perfect finishing touch to virtually any skin treatment. Add 15 minutes of Light Therapy to any Massage or Facial session to try this remarkable breakthrough. Probe Treatments – The Synergie LT2 device has the ability to use two different types of probes, the D880plus or the D405 Blue Light. This allows the treatment of all types of skin. Pad Treatments – The Synergie LT2 also allows the use of the new Dynatron XP Light Pad, finally making treatments of larger areas practical. Perfect for the treatment of cellulite. Light Therapy, also known as photorejuvenation, has been shown through years of research to increase ATP synthesis accelerating cellular metabolism and collagen production resulting in smoother and softer skin. Synergie Light Therapy is the perfect finishing touch to virtually any skin treatment. ...you can look younger and feel better about the appearance of your skin.